In 2013, Kat and I wrote what turned out to be a very popular Beginner’s guide for comparative bacterial genome analysis. After four years and 120,000+ downloads of the guide, we thought it might be time to update the hands-on tutorial that was included. As with any science, there have been advances in this time. We don’t have time to update all aspects, but felt it was important to update the recommended assembler from Velvet to SPAdes. The latter has become the ‘go-to’ assembler with our lab and many others over the last few years. Unfortunately, SPAdes does not work with Windows, but Windows users can use the original Velvet assembler if they wish to attempt their own assembly. Also, Ryan Wick in our lab has developed a way to visualise the assembly graphs produced by SPAdes and other assemblers, in the form of a software program called Bandage. This allows us to examine and compare the properties of assembly graphs, useful if you are trying to assemble the same set of reads with different methods or parameter settings. The other changes in version 2 are mainly to fix broken links to the E. coli sequences that have now been archived by NCBI, kindly pointed out to us by Michael Hall and others via email. We continue to recommend Artemis and ACT for visualising and comparing annotated bacterial genome sequences, and both tools are still actively maintained at the Sanger Institute. While BRIG is no longer actively maintained, we continue to recommend it as it appears to be stable across newer versions of Java and BLAST, and it remains incredibly useful. Yesterday I spoke at a workshop for JAMS TOAST (Sydney’s Joint Academic Microbiology Seminars – bioinformatics workshop)… I was asked to cover tools for comparative genomics, so I put together a list of the tried and tested programs that I find most useful for this kind of analysis. So here is the list. These tools are useful for small-ish scale genomic comparisons, in the order of 2-20 genomes. Most of these tools are for assembled data, hence we start with how to assemble your data… this will become less of an issue as we move to long read sequencing with PacBio and MinION etc, but for the moment most of the data I work with is from large scale sequencing projects with Illumina (100s-1000s) so we use mapping-based approaches for a lot of tasks… so I have included a few comments about this at the end. Some of these tools, particularly the visualisation of whole genome comparisons (using Artemis & ACT, Mauve, and BRIG) are covered the in the tutorial from our 2013 “Beginner’s guide to comparative bacterial genome analysis using next-generation sequence data“. So if you want a walk-through, that’s a good place to start. Note that we have updated the tutorial (as of July 2017) to version 2, available here. First things first – Are my reads good quality? FastQC – Generate graphical reports of read quality from the fastq files. SPAdes – de Bruijn graph assembly, incorporating multiple kmers and read pairing information in the building of the graph. Think of this as a more sophisticated version of Velvet… in my experience, it nearly always provides better assemblies than Velvet, except on the rare occasion (1-5% of read sets) where it fails to get a good assembly at all. In which case, try Velvet! 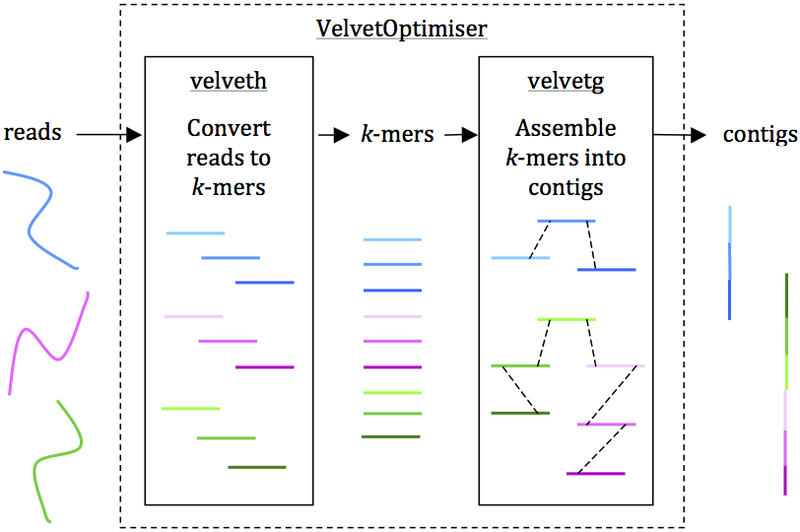 Velvet – The first and most widely used de Bruijn graph assembler built to tackle the problem of short reads. Graphs are built using a single kmer value, and read pairing information used for scaffolding only (unlike SPAdes, where multiple kmers are incorporated into a single graph and read pairing is also used directly in building the graph). How do you know what kmer to use? Use Velvet Optimiser. Hate the command line? Try Vague, a GUI wrapper for Velvet. What other assemblers are there? What’s best for what task? Take a look at Nucelotid.es and Assemblathon. How can I view my assembly graphs? Try Bandage – freshly released from Ryan Wick, a MSc (Bioinformatics) student in my lab. Bandage allows you to view and manipulate de Druijn graphs output by Velvet or SPAdes… lots of super cool features and useful applications, see the github site for examples. Now you have a nice set of assembled contigs – where are all the genes? RAST – Web tool (upload contigs), uses the subsystems in the SEED database and provides detailed annotation and pathway analysis. Takes several hours per genome but I think this is the best way to get a high quality annotation (if you have only a few genomes to annotate). Prokka – Standalone command line tool, takes just a few minutes per genome. This is the best way to get good quality annotation in a flash, which is particularly useful if you have loads of genomes or need to annotate a pangenome or metagenome. Note however that the quality of functional information is not as good as RAST, and you will need several extra steps if you want to do functional profiling and pathway analysis of your genome(s)… which is in-built in RAST. PATRIC – for certain bugs only, but has good online tools for genome comparisons. VFDB – broader range of species, but varying levels of comprehensiveness and you need to do more of the work yourself. PHAST – Upload your genome and this will identify likely prophage regions, summarising these at the level of whole phage and also individual genes. There are zillions of genome browsers out there, but I still love Artemis… and not just because I’m from the Sanger Institute. Unlike most genome browsers, Artemis was custom-built for bacterial genomes, which let’s face it are really quite different from humans and other eukaryotes. The default view shows you your sequence and annotation, with 6 frame translation and allows you to easily edit or create features in the annotation, graph sequence-based functions like GC content and GC skew, and do all manner of other useful things. It’s been around for a zillion years (well, at least 10 or so) and is very well developed and supported. Artemis has lots of cool features built in, including the ‘BamView’ feature that allows you to view BAM files that show the alignment of reads mapped to your genome, zoomed in to the base level or zoomed out to look at coverage and SNP distributions… this is also super handy for viewing RNAseq data, as you can easily see the stacks of reads derived from coding regions. Artemis also has DNA Plotter built in, which you can use to generate those pretty circular figures of your genome sequences and their features. Plus, when you’ve got used to using Artemis to get to know your shiny new genome, you can move on to viewing comparisons against other genomes using ACT – the Artemis Comparison Tool. NOTE: Walk-throughs of these tools, using examples from the 2011 E. coli outbreak in Germany, are covered in the “Beginner’s guide to comparative bacterial genome analysis using next-generation sequence data“. 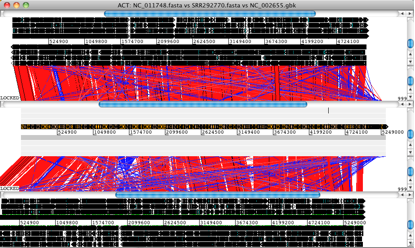 ACT (Artemis Comparison Tool) – Visualises BLAST (or similar) comparisons of genomes. This is most useful for comparisons of two or a few genomes, and makes it easy to spot and zoom in to regions of difference. Mauve – Whole genome alignment and viewer that can output SNPs, regions of difference, homologous blocks, etc. It can also be used to assess assembly quality against a reference, using Mauve Contig Metrics. BRIG (BLAST Ring Image Generator) – Gives a global view of whole genome comparisons by visualising BLAST comparisons via pretty circular figures. This is suitable for comparing lots of genomes, although because you have to enter each one through the GUI, it’s tricky to do more than a dozen or so. Gingr – View the phylogeny and associated SNP calls (VCF format)… also useful for visualising tree + VCF that you have created in other ways, e.g. from mapping. Gubbins – A new implementation of the approach first used in Nick Croucher’s 2011 Science paper on Streptococcus pneumoniae. Command-line driven and runs pretty fast (<2 hours usually on our data). BRAT NextGen – Uses a similar idea to Gubbins but using Bayesian clustering is GUI-driven… sounds nice, but actually I find it less convenient than Gubbins as there are manual steps required and then you need to run lots of iterations to get significance values. If you have specific questions to answer, where precise variant detection is important (e.g. allele calling, MLST, SNP detection, typing, mutation detection), mapping provides greater sensitivity and specificity than assembled data. Basically, if you want to be really sure about a variant call, you should be using the full information available in the reads rather than relying on the assembler and consensus base caller to get things right every time. See our SRST2 paper if you don’t believe me. Also, if you need quick answers to specific questions, this is almost always going to be achieved faster and more accurately if you work direct from reads without attempting to generate high quality assemblies first. For mapping our go-to is BWA or Bowtie2 (getting from fastq -> BAM). For processing of BAMs we use: SAMtools and BAMtools for variant calling, and BAMstats and BEDtools for summarising coverage and other information from the alignments. UPDATE: Version 2 of the tutorial (posted July 2017) is available here. This is a shameless plug for an article and accompanying tutorial I’ve just published together with David Edwards, my excellent MSc Bioinformatics student from the University of Melbourne. The accompanying tutorial is available here. High throughput sequencing is now fast and cheap enough to be considered part of the toolbox for investigating bacteria, and there are thousands of bacterial genome sequences available for comparison in the public domain. Bacterial genome analysis is increasingly being performed by diverse groups in research, clinical and public health labs alike, who are interested in a wide array of topics related to bacterial genetics and evolution. Examples include outbreak analysis and the study of pathogenicity and antimicrobial resistance. In this beginner’s guide, we aim to provide an entry point for individuals with a biology background who want to perform their own bioinformatics analysis of bacterial genome data, to enable them to answer their own research questions. We assume readers will be familiar with genetics and the basic nature of sequence data, but do not assume any computer programming skills. The main topics covered are assembly, ordering of contigs, annotation, genome comparison and extracting common typing information. Each section includes worked examples using publicly available E. coli data and free software tools, all which can be performed on a desktop computer. In the paper and tutorial, we introduce the four tools which we rely on most for basic analysis of bacterial genome assemblies: Velvet, ACT, Mauve and BRIG. All except ACT were developed as part of a PhD project, and have endured well beyond the original PhD to become well-known bioinformatics tools. New students take note! In the paper, each tool is highlighted in its own figure, which includes some basic instructions. This is reproduced below, but is covered in much more detail in the tutorial that comes with the paper (link at the bottom). Possibly the most popular and widely used short read assembler, developed by the amazing Dan Zerbino during his PhD at EBI in Cambridge. Quite a PhD project! This will produce a set of contigs in multifasta format for further analysis. See Additional file 1: Tutorial for further details, including help with downloading reads and using VelvetOptimiser. Part of the Sanger Institute’s Artemis suite of tools. Also look at Artemis (single genome viewer), DNA Plotter (which can draw circular diagrams of your genomes) and BAMView (which can display mapped reads overlaid on a reference genome), they are all available here. Artemis and ACT are free, interactive genome browsers (we used ACT 11.0.0 on Mac OS X). • Open the assembled E. coli O104:H4 contigs in Artemis and write out a single, concatenated sequence using File -> Write -> All Bases -> FASTA Format. • Generate a comparison file between the concatenated contigs and 2 alternative reference genomes using the website WebACT. • Launch ACT and load in the reference sequences, contigs and comparison files, to get a 3-way comparison like the one shown here. Here, the E. coli O104:H4 contigs are in the middle row, the enteroaggregative E. coli strain Ec55989 is on top and the enterohaemorrhagic E. coli strain EDL933 is below. Details of the comparison can be viewed by zooming in, to the level of genes or DNA bases. Developed by the wonderful Aaron Darling during his PhD, he is now Associate Professor at University of Technology Sydney. Also see Mauve Assembly Metrics, an optional plugin for assessing assembly quality which was developed for the Assemblathon. Mauve is a free alignment tool with an interactive browser for visualising results (we used Mauve 2.3.1 on Mac OS X). • Click ‘Add Sequence…’ to add your genome assembly (e.g. annotated E. coli O104:H4 contigs) and other reference genomes for comparison. • When the alignment is finished, a visualization of the genome blocks and their homology will be displayed, as shown here. E. coli O104:H4 is on the top, red lines indicate contig boundaries within the assembly. Sequences outside coloured blocks do not have homologs in the other genomes. BRIG is a free tool that requires a local installation of BLAST (we used BRIG 0.95 on Mac OS X). The output is a static image. • Launch BRIG and set the reference sequence (EHEC EDL933 chromosome) and the location of other E. coli sequences for comparison. If you include reference sequences for the Stx2 phage and LEE pathogenicity island, it will be easy to see where these sequences are located. • Click ‘Next’ and specify the sequence data and colour for each ring to be displayed in comparison to the reference. • Click ‘Next’ and specify a title for the centre of the image and an output file, then click ‘Submit’ to run BRIG. • BRIG will create an output file containing a circular image like the one shown here. It is easy to see that the Stx2 phage is present in the EHEC chromosomes (purple) and the outbreak genome (black), but not the EAEC or EPEC chromosomes.